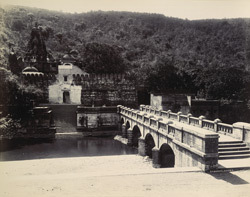 Photograph of the Damodar Temple and a bridge at Junagadh in Gujarat, taken by the travelling commercial photographer F. Nelson in the 1890s. The album is inscribed: “With best compliments from H.H. Rasulkhanji, Nawab of Junagadh (India)” and was formerly in the collection of Sir William Lee-Warner (1846-1912), who served in the Indian Civil Service and was a Member of the Council of India between 1902 and 1912. This view shows a bridge spanning the Sonarekha river, with the temple set on the far hillside reached by a flight of steps. The river has its source at the foot of Mount Girnar, which lies three kilometres (two miles) east of Junagadh and is the highest point on the Saurashtra peninsula. It has been an important pilgrimage site since the 3rd century BC. The mountain is particularly sacred to the Jains but also to Muslims and Hindus and there are a number of temples on it and in the environs.